The Lower School Makery might seem, to the casual observer, to be little more than a closet filled with trinkets. There are scraps of wood and PVC pipe arranged neatly on the shelves; guts of various electronics are laid out on the floor. Odds and ends that might normally be thrown away—lids in interesting shapes and sizes, for example—are sorted into bins, waiting to be repurposed. Once a week, the Makery opens during recess to give students access not just to the “trinkets” but to the tools that are meticulously arranged in a tool chest. As soon as the Makery doors open, students scramble to get inside, ready to hammer and saw and hot glue raw materials together into interesting new creations. Their excitement is palpable. It’s kinesthetic learning at its finest. Spaces like the Lower School Makery facilitate a learning mindset called Maker education. 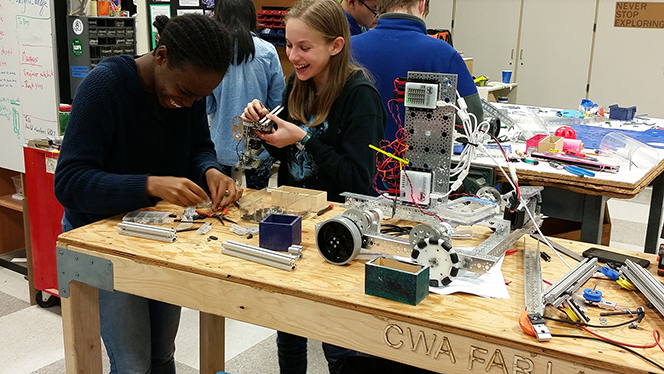 Maker education is a combination of hands-on learning and project-based learning. Spaces like the Lower School Makery have been burgeoning for the past several years, in part due to the widespread availability of laser cutters and 3D printers, which make designing and creating prototypes faster and cheaper than ever before, empowering everyday people to create rather than simply consume. With a $50,000 gift from an anonymous donor, those plans are quickly becoming a reality. And as 7th Grade wood shop teacher Bob Gordon retires this year, a natural opportunity has arisen to transform the wood shop space into a modern Innovation Lab with those designated funds. The Innovation Lab is a physical space to engage in design thinking. It will be located in the middle school building but available for all students in grades 1-12. Maker education can happen in many spaces – on the field, off-campus, and in Lower School classrooms. But the Innovation Lab is a place to work when specialized equipment is required or when messes associated with prototyping make other spaces impractical for use. It will be open for students in August 2019. Upon completion of the new Innovation Lab, students will have access to tools such as 3-D printers, laser-cutters, arduino programming and circuitry, sewing machines, and a green screen for video production work. They will also be able to use the kinds of recycled materials and found objects that are currently available in the lower-school makery for prototyping. Most importantly, they will have an opportunity to build skills with these tools and apply those skills to solving real problems. Mr. Meinershagen’s students have already been exposed to the benefits of these new technologies, particularly as they worked on building mousetrap cars in their study of rotational inertia. “In the past, making wheels was a daunting task,” said Mr. Meinershagen. “It could take a week to get a good set of wheels built. With some of the tools that we now have such as the laser cutter and design software, students can take their drawings to Joe Sparano, Lower School and Middle School Technology Integration Specialist, and have a set of wheels in 12 minutes.” This kind of rapid prototyping gives students low-risk opportunities to try out new ideas. This kind of applied learning benefits students by answering the perennial “Why does this matter” question. There’s a reason and motivation inherent in the problem solving process. While the new technologies provide fast feedback loops for students, enabling them to find solutions to their problems more quickly, the collaborative nature of the problem solving approach often has social and emotional benefits as well. When Ms. Gerla and Ms. Harris visited Portland Jewish Academy’s maker space earlier this year, they observed a group of fourth-grade students in the testing phase of a game design project. They were playing each other’s games and offering critical feedback. It appeared that the students were engaged in a project that taught them to think like designers, creating and testing a real product and refining the product based on users’ critical feedback. However, the makerspace director revealed that the goal of the project had been a social one. As Charles Wright has explored different avenues to student success, maker education, sometimes referred to as design thinking, have emerged as pedagogical tools that can positively impact the widest range of students. The maker ethos is interdisciplinary, both high tech and high touch, capable of teaching measurable analytical skills alongside the harder to quantify soft skills. It’s an age-old practice of skill sharing with a bit of a technological facelift. Making also attempts to restore the balance between technology and design by encouraging its practitioners to think through problems as designers might by first identifying and empathizing with users’ needs and using those needs to guide the problem solving process.